Have you ever wondered how some cards, despite their rarity, are so out of line with cards from recent sets of the same rarity? Some of Modern’s biggest offenders are below. These cards are from the earliest stages of Modern’s history. I would refer to this as the “Pre-Mythic Age.” Mirrodin through Shadowmoor has the lowest print amounts of any Modern-legal Magic cards. Despite this fact, the absence of Mythic rares means there are generally more rares than you would expect from that set. This means that even despite Vedelkan Shackles being reprinted as a Mythic in Modern Masters, it is still relatively easy to find. What happens to these types of cards when they get reprinted? Well look at Smash to Smithereens. It was strictly a sideboard card that cost over $5.50 as a common! What happens when it’s reprinted twice in one calendar year? Well it’s worth basically nothing. Despite the fact that Modern Masters 2015 was a very limited print run, more copies of Smash to Smithereens were printed in that set than probably in all of Shadowmoor. Another issue we have with older cards is they’re just lost. There are probably people that have 20-30 copies of smash to smithereens in some box they never look in. 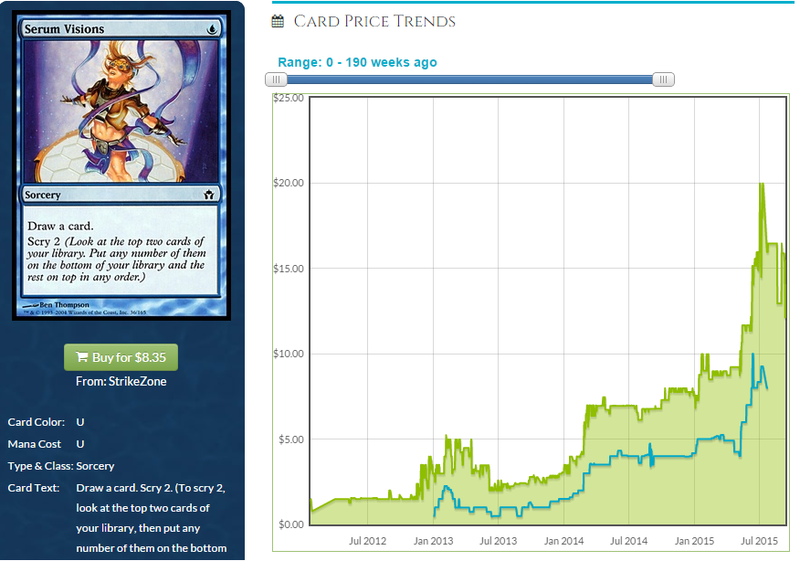 If a card goes up gradually over the course of a year (Smash went from ~ $1.50 to $4 in 12 months), people don’t notice it. This is a reason why sometimes, spikes in price are good. Quick price corrections cause people to dig up “lost supply” and reintroduce it to the market. This helps undo some of the damage from a spike if the supply is high enough. There have been a few sets that are heralded as the start of “Golden Ages” in Magic. There were a few in particular that brought Magic back from the brink of extinction but usually did not last long. Rather ironically, the short Golden age periods were during gold themed sets. Invasion and Ravnica blocks are often pointed as significant to bring players back into the fold. Finally, we’ve reached a kind of equilibrium that brings players back into the game for good. Shards of Alara starts this first post-mythic Golden Age. As players return to the game after a rather unpopular block, much more product is opened than usual. As you might expect, cards from these sets (which were printed up to 7 years ago) are much easier to find and cost less. There are still some standouts because the player base has had 7 years to grow! Terminate is a recent example of a card that was obscure but once demand increases it can very quickly out strip supply, even of a common. But still, as you can see, reprinting a card can still end up bringing it out of the stratosphere. 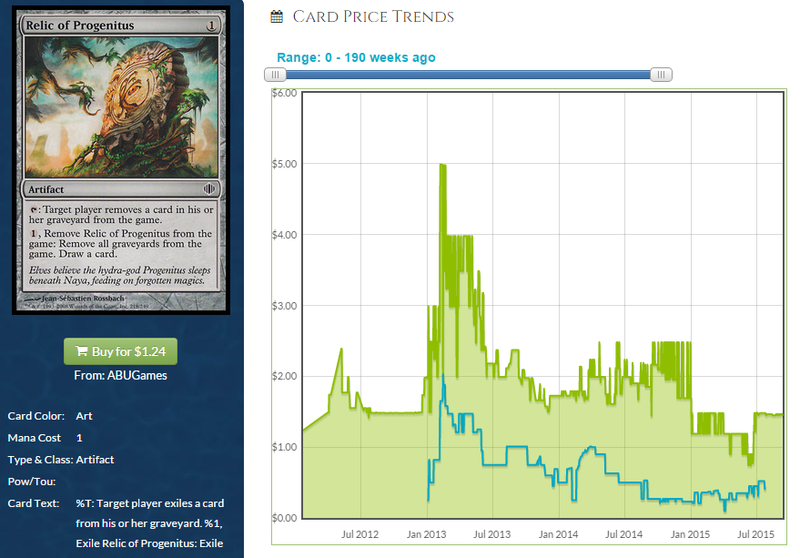 Relic of Progenitus was reprinted at a higher rarity in Modern Masters and yet still lost 60% of it’s value. Cards from these sets can usually support casual play but strong Modern demand sends them through the roof. As we get toward the end of this Golden Age, it becomes a lot harder for most commons to keep up large price tags. 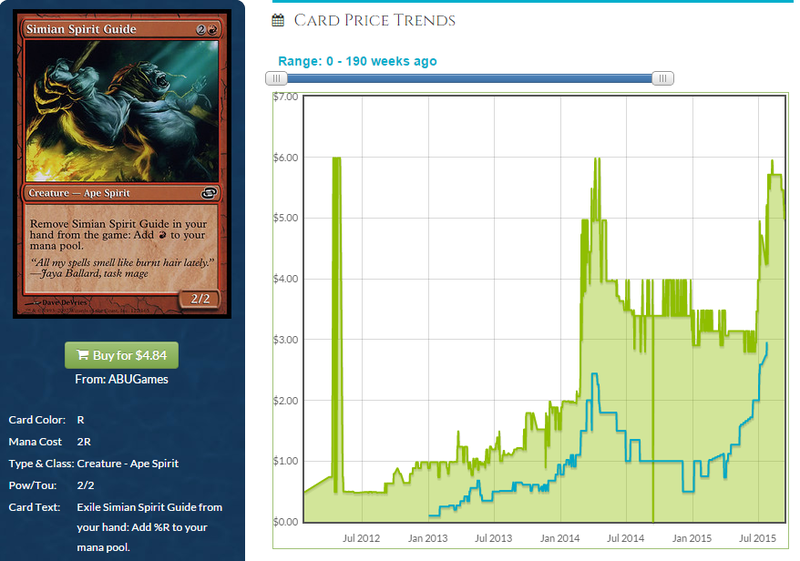 Worldwake‘s Dispel has never been more than $0.50 despite it’s popularity. These two blocks dictate a lot of the trends that would follow into more recent sets. With Scars of Mirrodin players are now expecting to return to previous planes and get reprints from that block. Scars of Mirrodin, despite only having 1 reprint at rare or mythic (Mind Slaver), showed that nostalgia fueled sets were coming and reprints could happen. 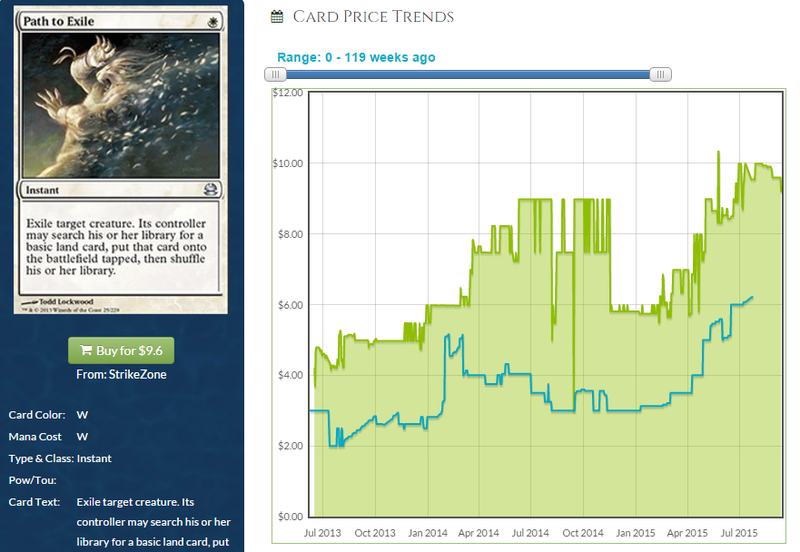 This was later a cause of the huge suppression of the prices of Zendikar fetch lands. People now expect to return to old planes and they expect some new and some old of what they know. These two blocks also prove the theory that later sets are opened much less than fall sets. There is only 1 common in Scars of Mirrodin worth more than $1 (Ichor Claw Myr), none in Mirrodin Besieged, and 1 in New Phyrexia (Gitaxian Probe). 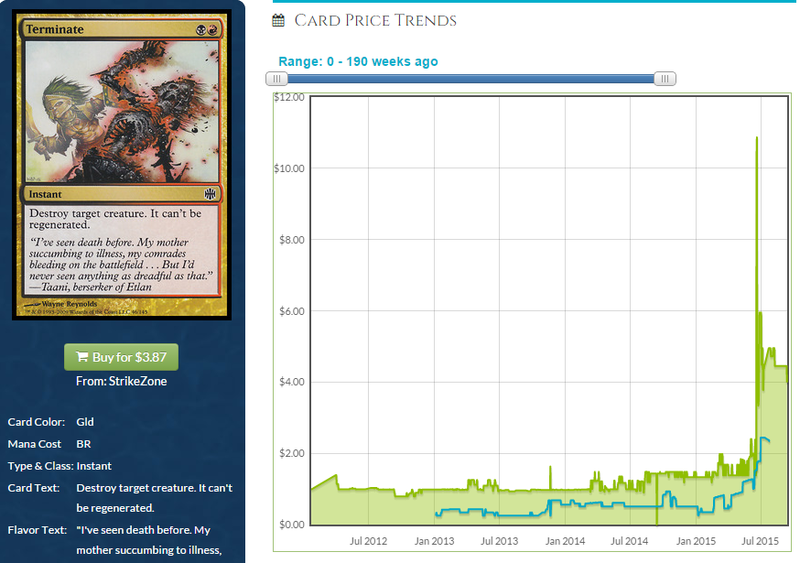 Once we go to higher rarities, New Phyrexia is by far the most expensive set despite the reprints. 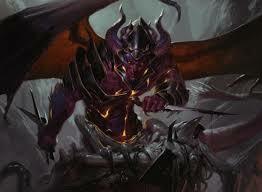 Avacyn Restored similarly beats out Innistrad and Dark Ascension. You know, Mirrodin left a bad taste in some people’s mouths. It wasn’t received well the first time and the 2nd time it brought together one of the worst marriages in recent standard (Jace, the Mindsculptor, Stoneforge Mystic, Sword of Feast and Famine, and later Batterskull). But you know what really get’s people’s gears going? Ravnica. You know what people love? Guilds. Do you know how much they love them? Enough to explain them in terms of cows. Return to Ravnica had 10 high profile reprints in the most precious Modern shock lands. This leads people to bust insane numbers of booster packs for these expensive reprints. People are a lot more likely to boosters when they know good cards are in them. So what does this all mean? Cards that have been reprinted infinity-million times are still worth money. That is true, there is one other factor to consider, playability. This graph is skewed a bit by Magic Online but should be a good jumping off point to make my point. Lightning Bolt has been printed 13 times. 13 times and it’s still $2! Yeah, some of the printings really don’t count. The combined number of sleeve playable Alpha, Beta, and promo Lightning Bolts is so small they don’t have an effect on other printing’s prices. What is notable is Lightning Bolt was a common in both M10 and M11 and an uncommon in Modern Masters 2015 but still commands a $2 price tag. When 4 copies of a card is played in 42% of decks it doesn’t matter how many times it has been printed as much. Serum Visions is only present in 21% of decks and commands a price point six times higher despite being half as popular. But Lightning Bolt can’t be the only card like that, right? Path to Exile’s first printing was during Conflux, the first post-mythic golden age. Since then it has been reprinted in a booster set once (Modern Masters) as well as available in 3 supplementary products and 2 promo printings. That should be a lot of copies, right? Path to Exile still commands a $9 price tag. But we can see from this graph that it didn’t always exist like that. 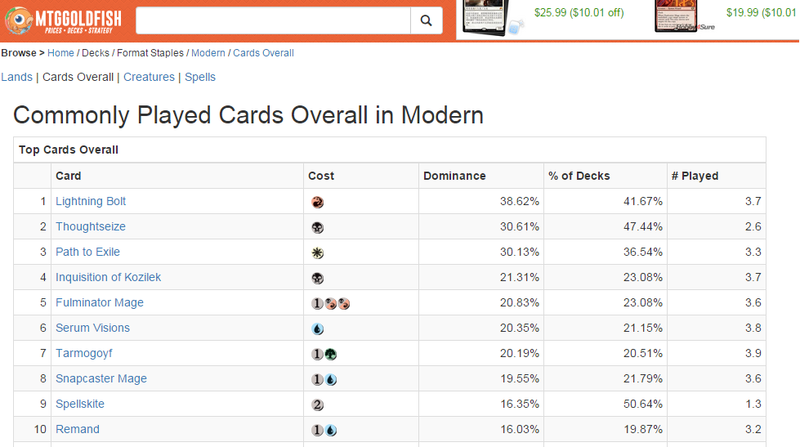 After it’s reprint in Modern Masters it was available for almost half as much as it costs now. When cards are reprinted in limited runs, it is imperative you buy in quickly because prices are often suppressed by players worried about a reprint. With this information I hope you can figure out why a card is expensive. It might be due to scarcity (Smash to Smithereens), playability (Lightning Bolt), or a combination of both (Serum Visions) and knowing how a reprint will affect it’s price accordingly. Paid subscribers see ads too. How rude. Some very good points in there. Great advice about buying in quickly after limited print reprintings. I think that Noble Hierarch and Spellskite are good examples of cards that will shrug off the reprint in MM15. The confidence factor you mentioned is very important as well. 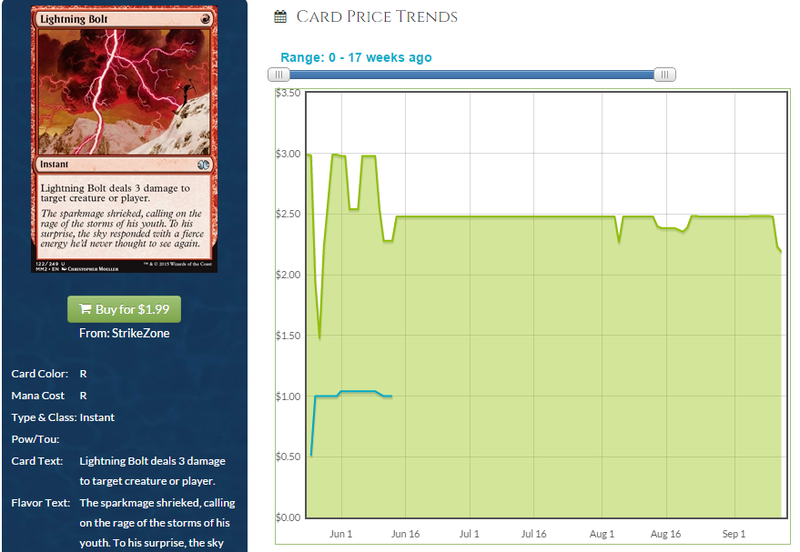 Many times cards drop way too low after a reprint. Especially the original printing. I love picking up the original printing of card right after it gets reprinted because people overreact and price them near the reprinted cards price. Often times you can even hit arbitrage numbers buying from TCGPlayer as people race to the bottom and then selling to Vendors buylist. I’ve come to love the opportunities that reprints create. Especially in limited print runs, like you mentioned. MM13 was much more limited than MM15 was and MM13 brought much more people into Modern than MM15 did, so we got way more supply form MM15 and a lesser grown demand. Two factors that let me think that MM15 cards won´t bounce back like MM13 did. 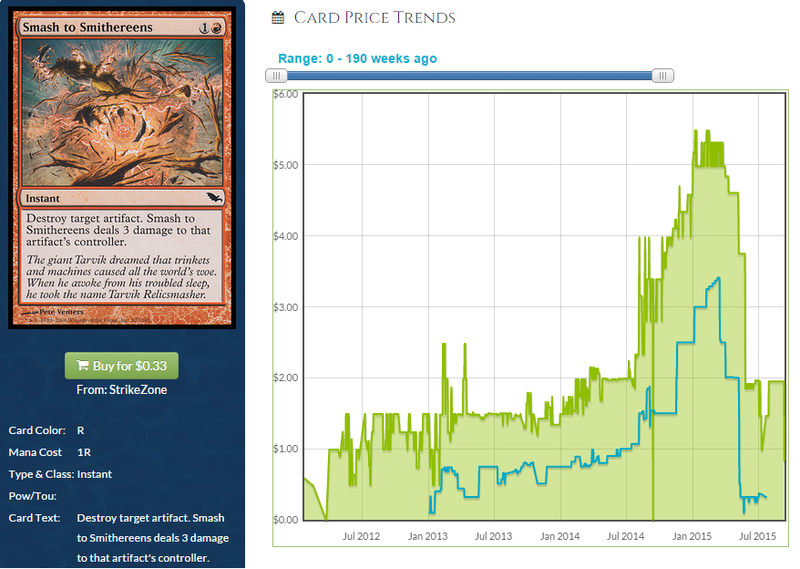 Not sure if a card like Thoughtseize would be a better pickup since it still skips its spike.. Interesting topic. I have some examples that could be interesting to discuss too. You name dispel, but what about spell pierce (zendikar) and ancient stirrings (ROE). Another great example is rancor. many reprints, common and uncommon. Spell Pierce saw a lot more play earlier than dispel did. Also dispel has been reprinted 2 years ago. Ancient Stirrings only very recently (this year) got expensive and it’s mostly due to it being in the last set of the block. Rancor is a little hard to explain. It has a strong casual following which makes it hard to quantify why it is so expensive.